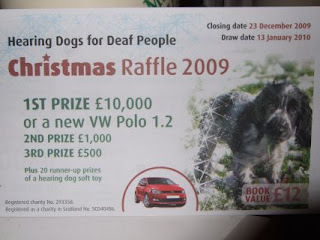 I'm fond of the Hearing Dogs charity, so I always like to check their website. 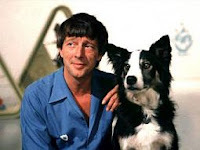 They've got a "Dug of the Month" that they put in their monthly newsletter, and it's always a heartwarming wee story. I suppose it could hardly be otherwise, given the subject matter. I was looking at October's piece about Flo, that month's winner. And just sat wondering - marvelling maybe - at the sheer unalloyed bravery of someone who can neither see nor hear, heading out into the streets, relying on a wee dug. I can't begin to comprehend the fortitude that would take. My life really is the proverbial bowl of cherries. I'm resolving to remember that. I'm also resolving to sell my fecking charity raffle tickets for them this time. £1 each. If anyone wants to buy any, leave a comment saying how many you're after, I'll stick the cash in for you, and I'll get it when I see you next. I have the tickets, here in the hoose. No scalping, guaranteed. I'll even tell you if you win. Fair? Err, some off you, even. Raffle tickets. I'm no' chatting you up. It's a technological oversight, not being allowed the opportunity to edit comments on folk's blogs, isn't it?